Over the last five years, the University of Plymouth has helped South West businesses access approximately £2million of investment for Knowledge Transfer Partnership (KTP). This UK-wide programme has been helping businesses tap into the wealth of knowledge, skills and technology in universities for the last 40 years. The average KTP costs £75,000 per year, with SMEs generally contributing approximately £25,000. This includes paying a KTP Associate, a graduate who works in the business for a set period of time and is jointly recruited and managed by the business and the University. According to Innovate UK, every pound invested in KTP typically yields a six to seven-fold return on investment. Internationally-renowned creator of medical rehabilitation and sports performance products DM Orthotics has recently completed its fourth KTP with the University of Plymouth. 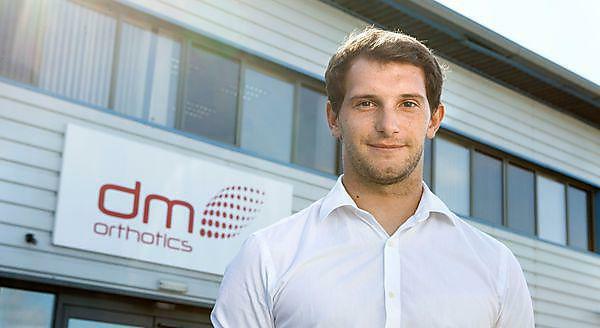 This is helping the Redruth-based company develop a number of products to support people with a range of medical conditions, including a sports sock for runners and gymnasts who have plantar fasciitis. Saltash firm Spinnaker is a world leader in security products for the cash in transit industry and has completed several KTPs with the University of Plymouth. The latest resulted in the firm creating valuable IP for a new bank note scanning system, replacing labour-intensive processes that are currently used by banks. “Having a clear idea of the end game is essential. You need to start the process with a key question you want answered. It also needs to be a question that hasn’t been covered before,” advises Martin Matthews. “You’ll only get good results if you actively manage your KTP Associate,” says Nick Tripp. “Be prepared to give time to that person and have an open door so they can talk to you,” adds Martin Matthews. “Be clear on what you want to achieve, but don’t be afraid to explore other opportunities as they arise to maximise benefits and deliver beyond the scope of the initial project,” advises Dave Marshall. “There are some quick benefits to doing a KTP, such as discovering what else is on the market, but research findings can take time to deliver commercial results,” says Martin Matthews. “As the KTP progresses, you can identify other areas of collaboration that will both complement your KTP, and support you over the longer term. The University supports businesses in all sorts of other ways and we are interested in forging ongoing relationships,” says Dave Marshall.